Coppertone sits in the shade for a moment while heading down to the canyon. The first part of the trail gently descends to the canyon rim. Getting there: From Ranch Road 620 in Lakeway exit onto Lakeway Blvd. and head north. Follow Lakeway Blvd. through its turns until you reach Hills Drive. You should see a sign for the swim center or World of Tennis. Turn left onto Hills Drive and then turn right onto Trophy Drive. Look for the swim center on the right and park in the parking lot there. The trailhead is on the opposite side of the road. 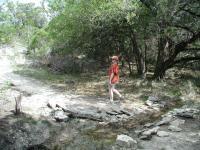 The Hike: The Canyonlands is Lakeway's newest park and one that provides refreshing solitude, despite its small size. The park encompasses only 20 acres, but the thick vegetation and steep canyon walls quickly erase some signs of the growing community around it. A view of the trail just as it is about to enter the canyon proper. The trail begins at the trailhead on Trophy Drive, immediately across the street from the swim center. The first quarter mile of the trail parallels a high tension Pedernales Electric Cooperative power line. This is technically not part of the park, but the PEC has granted an easement to allow for easy access to it. The trail here is very well maintained with a thick, sometimes heaping, layer of mulch. The trail descends from the rim into the canyon below on the northern half of the park. Some small spots can be steep. Where the trail splits on the map there is a choice. From here the two halves of the trail make a figure 8 with this point at the center. If you're short on time the north side provides a rougher trail with more elevated, scenic views. 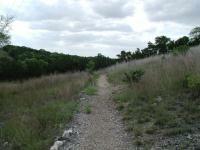 But at only about 2 miles, there are few who could not complete the entire trail in a quick outing. 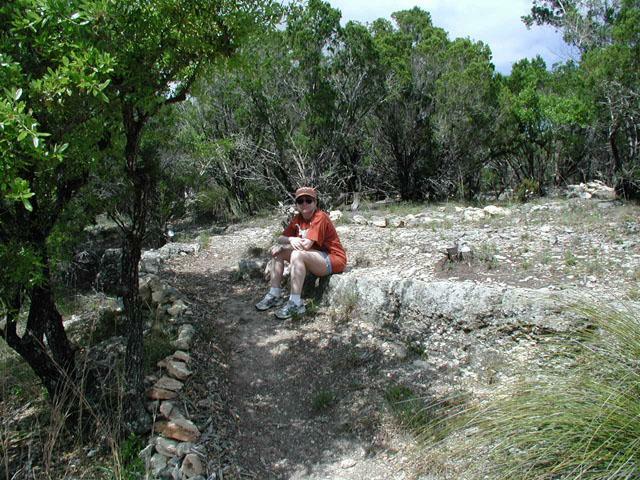 The access trail to the canyon rim is surrounded by Live Oak and Juniper, but not very shielded from the Sun. That changes when the trail descends into the heart of the canyon. 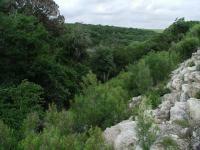 The vegetation becomes dense, more diverse, cooler and more humid. The Sun is well filtered near the bottom of the canyon. The trail surface in the canyon itself is rougher than the mulched path leading up to it. Packed dirt and rock line the path and some small sections can be a bit steep. 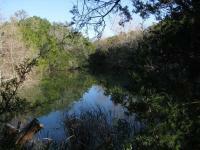 A small stream runs through the canyon that eventually feeds into Rough Hollow Cove and Lake Travis. 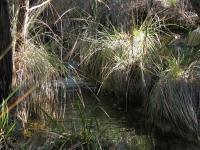 Two small ponds dot the creek's path. While the stream was small on our visit the signs around us point to wetter periods that carved the canyon we see today. One probably does not want to be at the base of the canyon after a heavy rain. During the one hour that I spent covering all of the trails I never saw another person. I did hear a couple of other folks out there, but the heavy tree cover in the canyon meant that I never caught a glimpse of them. Pretty great hike, one of my favorites I've done in this area. The trail along the river/creek has some great views and if you get a look down at the water in certain parts it is crystal clear in those big pools. Dislike the amount of noise from nearby construction and roads, such a shame they build around places like this. Definitely worth a morning or afternoon of hiking though! 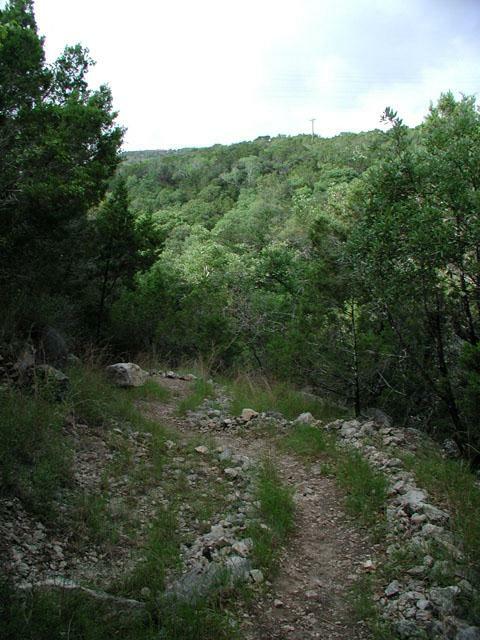 I have this #5 behind McKinney Roughs, Walnut Creek, River Place, and Barton Creek for near-Austin hikes (with Hamilton Greenbelt in Lakeway #6). Don't be fooled by the loop on the map here. That is the serene loop and its far less interesting and shorter than the rest of the park. Head to the right on one of the two trails instead of going left to Serene Loop. 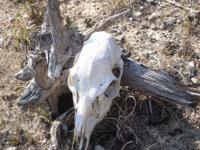 They will intersect, and then had left on the Canyon Descent Trail. You head down and then eventually back up in a loop through the park (though avoid the Rim trail on the way back its about the only dull trail in the park). Download the city of Lakeway map as you will need it to find your way around. Great trail in a nice area! Well worth the drive. New spur trail from west side of the canyon leads to Mt Lakeway and incredible views in all driections. Beautiful Madron forest along the way. It was nice, we tried to hike all the trails but got turned around and missed a few in the middle of the west/north loop. Other than that they do label most trails with arrows. Erica took a pic of the map which we hope to post as the topo map on here doesnt show everything on that side. They've built some bridges which ruins some of the water crossing appeal. Saw one guy on a bike but no one else. 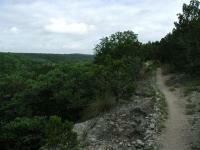 Very nice hike and worth a trip to Lakeway. I took my wife on Valentines day and we discovered in our opinion; the most romantic hike in town. Stay to the right and you will find the hidden natural pools and trust me; you wont want to leave! 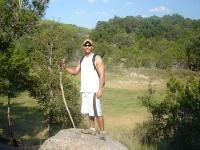 Charming hike with a couple of choices for hikes. As others have described, this an attractive walk with three trails that can easily be completed in an hour. Just enough ups and downs and just enough change in the scenery to please everyone.